We were just dicussing how Lawrence wasnt CONFIRMED, not how he wasnt in the movie. 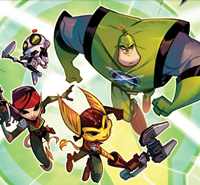 We dont know yet if he's in the movie, but DHW said that Nefarious is just in as a cameo for Qwark's "Rise to fame" ad. There is a Really Random Thread already, you don't have to make a new one.